Frostbite 3 hits the road on next-gen console. Having convincingly toppled the Xbox One in terms of both resolution and performance, the PS4 release of Battlefield 4 stands as the first game to show a theoretical "on-paper" advantage manifest as a practical one. 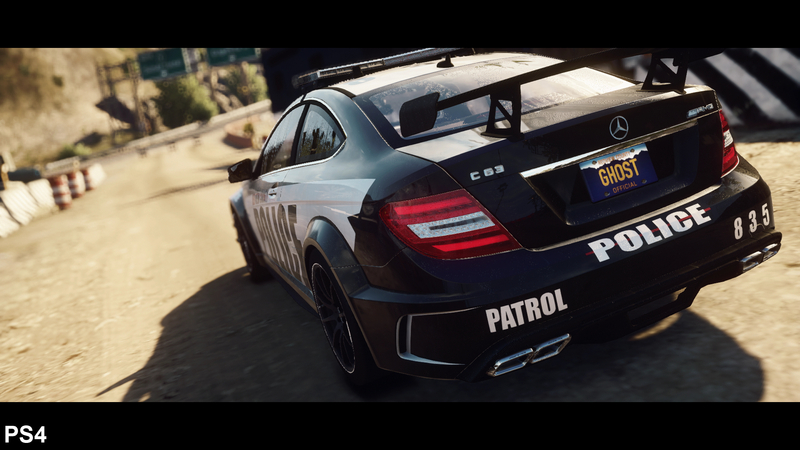 But today we turn from shooters to racers; coming from the newly-formed Ghost Games, Need for Speed: Rivals uses the very same Frostbite 3 engine to deliver a next-gen cops-versus-crooks chaser that blends single and multiplayer modes into one. However, given the series' strong history of platform parity - with PS3 and 360 releases of Most Wanted being almost like-for-like - do we dare to expect any clear performance leader with this new engine? Suspicions are raised that this may be the case, following hints from producer Marcus Nilsson that Rivals may look "a little" better on one platform than the other - this superior version in fact sharing the graphical quality of the eventual PC version. While it's rare for a developer to make a concession like this ahead of a title's launch, the drive for parity across most of the game's design and visuals is still at the heart of the project. So what do we have? The build under our magnifying glass is confirmed by Ghost Games as 99 per cent close to final, with only minor tweaks left ahead of its launch this month. The claim to achieving a native 1920x1080 on both PS4 and Xbox One is also made, and certainly holds muster with our tests - the full HD standard giving each platform equal footing in terms of base image quality. The result is a level of crystal clarity we'd always hoped next-gen platforms would deliver from the outset; the resolution boost helping us easily pick out oncoming cars while driving at break-neck speeds - a refreshing change coming from the 720p standard. We played the game at a recent EA event designed to give reviewers a taste of the game's multiplayer experience. Meanwhile, overall image quality is aided on both next-gen consoles by use of post-processing anti-aliasing, equivalent to the best possible in existing Frostbite 3 PC titles. This treats most jagged edges without decimating texture detail, though curiously, the Xbox One version's approach comes with unique permutations; edging on transparencies such as tree leaves are softened, and very distant hill-side details lack the definition seen on PS4. Otherwise, edge treatment is identical between the two platforms where anything in the foreground is concerned - meaning you have to look hard to spot the difference. "Of the next-gen titles we've seen to date, Need for Speed: Rivals offers the closest experience we've seen between Xbox One and PS4." 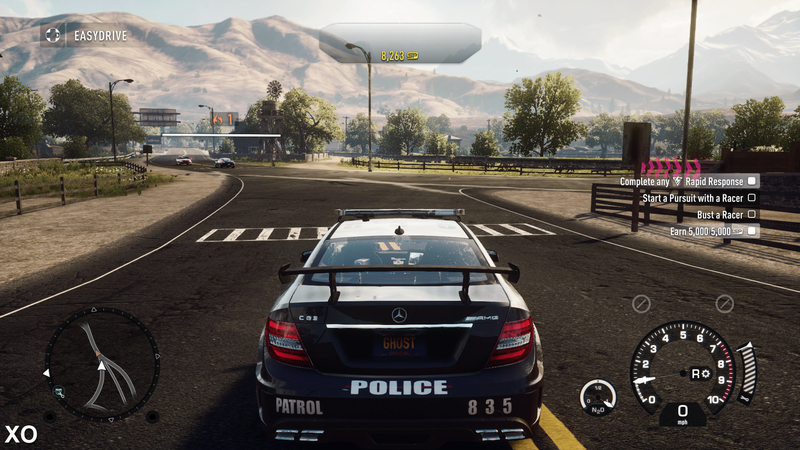 The PlayStation 4 and Xbox One versions of Need for Speed: Rivals compared. For the best viewing experience, be sure to select 1080p from control settings above. Up close, there's no difference in assets between the two either. Textures appear just as sharp, rain effects, motion blur and destruction physics are each fully instated, while town and car detailing is like-for-like. You can judge this for yourself with our 30-strong Need for Speed: Rivals image gallery, taken from the tutorial section where day-night cycles and weather are uniquely synchronised. It's worth noting, however, that landscapes are still occasionally toned differently due to randomised cloud positions, which affects the lighting in spots. With that being said, two key differences between the PS4 and Xbox One versions do bear mention. The first is that Sony's platform makes use of a bokeh depth-of-field effect to distinguish the foreground from a backdrop, noticed mainly during pre-race camera angles. It's a pleasant effect that recreates the results of real-life photograpy when a camera's aperture is reduced, causing distant lights to appear as enlarged luminous specs - a look that's entirely absent on Xbox One. In its place, Microsoft's platform applies a less refined haze filter that slightly impacts the clarity of car details in the foreground. Thankfully this only applies for these fleeting moments, and once the race gets started both platforms remove their chosen depth-of-field effects to unleash like-for-like images. The second difference is in the Xbox One's utilisation of ambient occlusion. 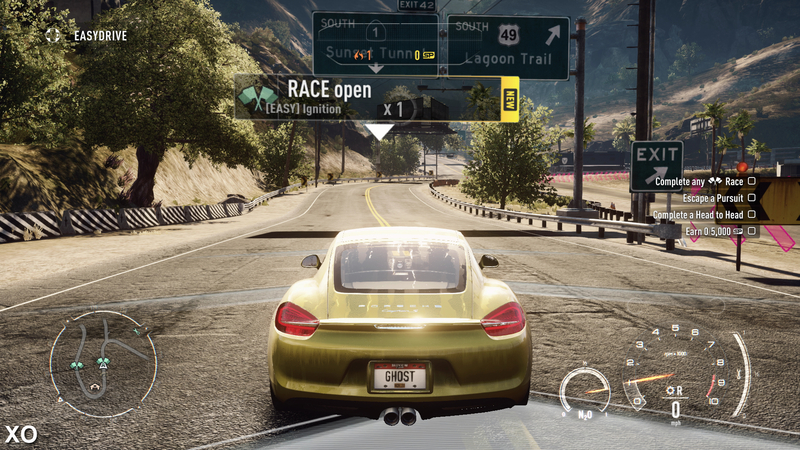 This is a self-shadowing calculation usually handled by the GPU, forming light patches of shading beneath a car's spoiler or wheels - though seemingly axed from the PS4 version at present. Even in shots taken from the very start of the game, where lighting conditions are principally as close as possible, the Xbox One's extra shading shows up around roadblocks and traffic cones, while other shadows play across the floor in the same way. It's an odd omission that reverses the scenario seen at Battlefield 4's review event, where the PS4 turned up with horizon-based ambient occlusion (HBAO) while Microsoft's console did not - a state of affairs that's set to be corrected in that case via a patch. Update: see the response from Ghost Games below, explaining that PS4 is actually implementing HBAO while Xbox One is utilising Frostbite 3's standard SSAO solution. 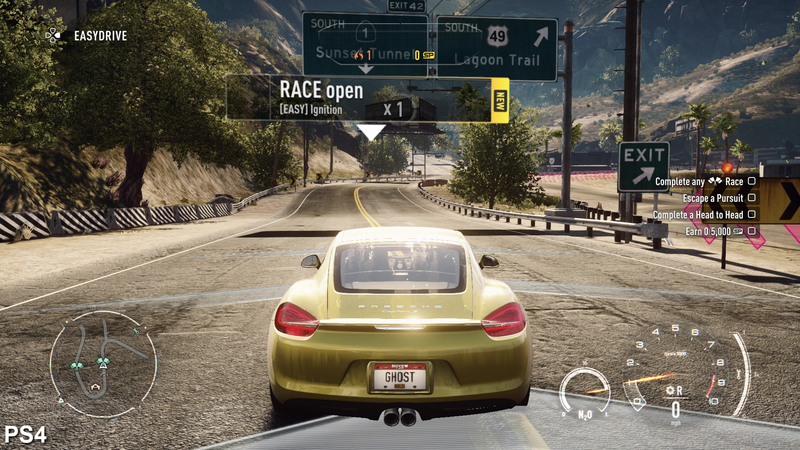 A stylish 'bokeh' depth-of-field effect is used for PS4's pre-race camera angles. This is entirely missing on Xbox One, which instead uses a cheaper blur effect- muddying car details until its removal on the start of a race. 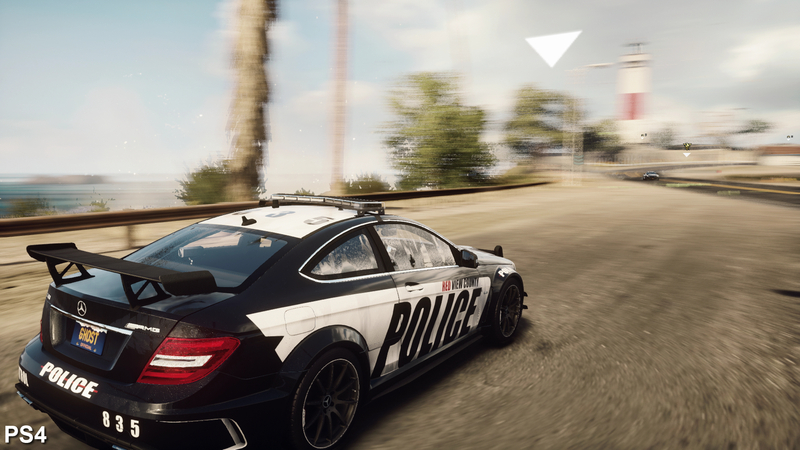 Full-screen motion blur is in constant effect during Rivals' high-speed pursuits, and neither console misses out on the improved physics precision, particle quality or alpha effects afforded by the new engine. Texture assets are also identical in this rare still shot of the game - the main differences you'll notice being in the way clouds overshadow the scene, toning the landscape. All eyes on the hills. You have to look to the far horizon to see any difference in level-of-detail scaling, where some trees and plants aren't being rendered on Xbox One. A nit-pick. With all else being identical, the game is a visual treat regardless of platform, and the improved lighting stands out especially on the muddied, rain-soaked coating of vehicles during lightning storms. The heavy full-screen motion blur effect doesn't quite do the game justice for in-action stills, so we defer to our video below to give a better idea of how the game looks in motion. The only fly in the ointment as far as presentation is concerned is that both platforms suffer from similar degrees of pop-in just after hopping directly to a race location, via a racer's hideout or a cop's command post. Texture maps and objects appear within the first second post-loading screen, but after this one-off blip, assets stream in smoothly on each platform at even top speeds. 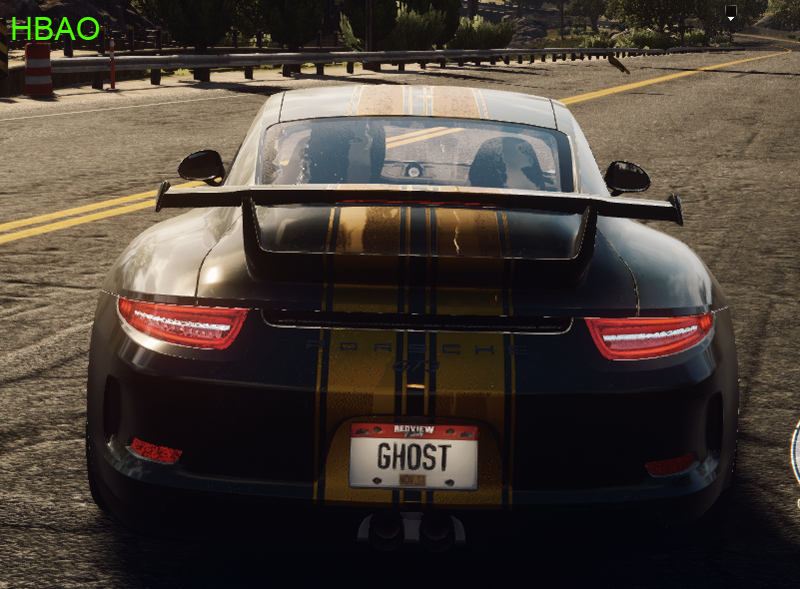 Perhaps surprisingly for a next-gen driving game, Ghost is targeting 30fps on both platforms. Based on previous interviews, the AllDrive multiplayer integration is cited as the main reason why 60fps is left on the cutting board. The idea here is that multiple racers can hop in and out of your single-player experience, to help or hinder you as you attempt to complete a set of objectives (such as intercepting rogue racers, or rapidly responding to other cops' calls for support). Weather conditions are consistent for all players locked into an instance too - meaning if it rains for one, it rains for all - but the studio remains hesitant on the idea of altering handling physics as a result of these conditions. 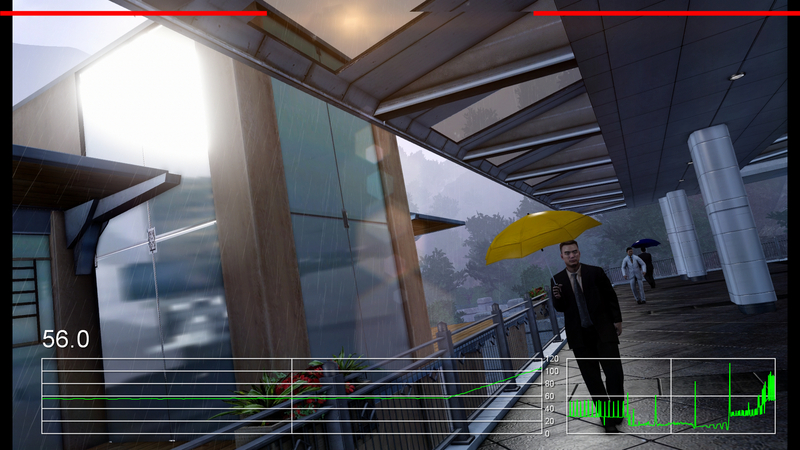 But does Need for Speed: Rivals actually pin down that promised 30fps? The answer is yes, and it does so with v-sync engaged too - but there is a caveat. You'll notice during the frame-rate analysis above that the line holds at an unerring average of 30fps, making just a single exceptional drop to 25fps while bursting through a complex dock area. It's undeniably a rock-solid frame-rate - but while a 30 frames-per-second average sounds good on paper, the practical reality is that motion still suffers from a perceived judder effect at points. "30fps is the target hit by each next-gen platform - but both exhibit frame-pacing issues, resulting in visibly off-putting judder. Ghost Games tells us it will be addressed in an upcoming patch." 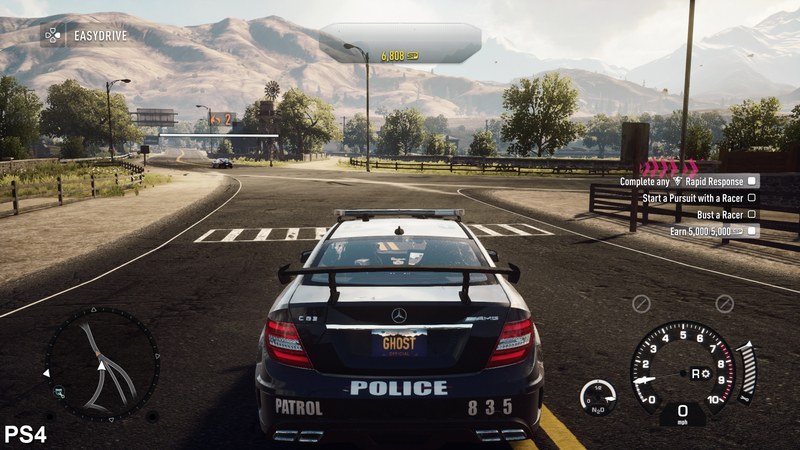 A frame-rate analysis of Need for Speed: Rivals shows a commitment to delivering a locked 30fps - but with a catch. When under load, the Xbox One and PS4 versions suffer from a stuttering effect that gives the perceived effect of screen judder. Rather than being due to dropped frames, this is as a result of Rivals delivering 30 frames-per-second in an uneven order. But why? Simply put, smooth 30fps games rely on a single unique frame being followed by a single duplicate frame, repeated over and over to give an even sense of motion from a console's typical 60Hz signal. The alternating order of these frames is crucial, but in Rivals' case we see stretches of play where two unique frames will be trailed by two duplicates - averaging out at the same overall frame-rate, but creating a discernible stuttering to camera motions as they whips past. This is one of the reasons why we are currently working on adding consistency graphs to our performance analysis videos (here's a sample of how it will look once complete). Frame-rate is an average, judder is a split-second phenomenon and in the case of Rivals, it has a fundamental impact on the look and feel of the game. Investigating further, we boot up Battlefield 4 on PC where the phenomenon is easy to replicate in the very same engine with a forced 30fps cap (via the command line: GameTime.MaxVariableFps 30). Again, the same jerky motion is experienced as a result of a string of unique frames being rendered, followed by a likewise number of duplicates to compensate - highlighting this as a possible quirk of Frostbite 3 engine itself. It's not a deal-breaker for Need for Speed: Rivals' playability on either system, but the game's ability to produce a consistent 30fps isn't being best served with this setup, and for some the sensation feels like it's dropping to as low as 20fps. All in all, our preliminary verdict of Need for Speed: Rivals is mostly positive; a true 1080p game on each platform, running at a consistent 30fps - though afflicted by the above-mentioned irregularities in motion. With asset quality and frame-rates being on par, each next-gen version comes packaged with a unique visual bonus; the refined bokeh depth-of-field on PS4, and the ambient occlusion on Xbox One - though neither find a moment to stand out during the core racing. Otherwise, Ghost Games' racer reaps the benefits of migrating to Frostbite 3 by adding greatly improved lighting and world physics - but never at the price of the series' finely-tuned signature controls - making it a characteristically solid showcase of either next-gen platform on launch. We'll revisit the game - and the PC and current-gen versions - closer to the UK launch of PlayStation 4 at the end of the month. Update: Wow, that was quick. We've just had feedback to this article from Ghost Games' Andreas Brinck, rendering lead on Need for Speed: Rivals - "I wanted to thank you for the excellent technical analysis of our game, but also ask for a small correction. The article states that the PS4 version of the game is missing ambient occlusion, but the fact is that the PS4 version actually is using it in the form of HBAO. Here are two screenshots from the PS4 demonstrating the difference between having it enabled (this is what's shipped and looking at the screenshots from the article it seems like this was in the build you played as well) and disabled. The effect is most visible on the exhaust pipes and the background, but can be seen on the armco as well." "The Xbox One version of is using the frostbite version of SSAO," he tells us. "The explanation for the frame-pacing is a bug in our settings, Even though the gameplay code is configured to run the game at 30Hz, the present interval of the renderer is incorrectly set to 1, which means that the renderer can present a frame at any multiple of 1/60 seconds. This will be fixed in an upcoming patch." Screenshots provided by Ghost Games clarifying the ambient occlusion situation on Need for Speed: Rivals on PlayStation 4. Has already signed on with Chinese production companies. No new NFS this year, but there is this. Which is launching in 19 new countries this month.